A great New York Daily News cover elicits emotion: shock, disgust or joy. It doesn't matter which one. The goal is to "give you that punch in the gut," editor in chief Jim Rich said. "It's going to elicit some sort of emotion and that in turn, hopefully, leads to some sort of further thought on the issue." Lately the Daily News has been landing a lot of punches, particularly on the issue of gun control. 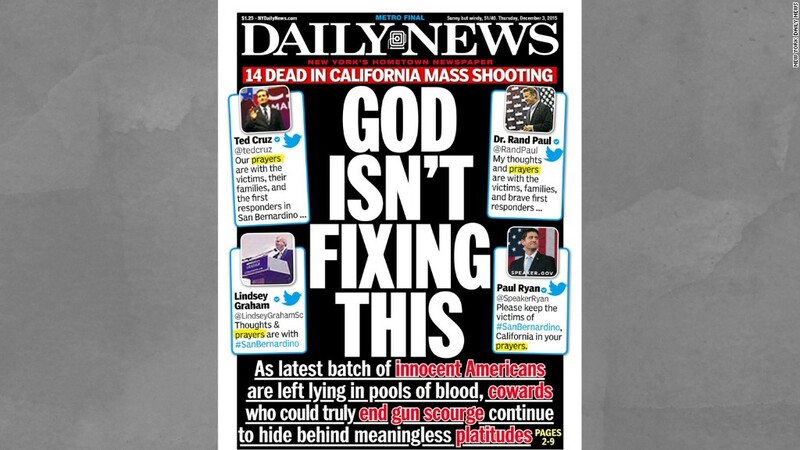 Its cover lambasting Republican politicians for sharing "thoughts and prayers" in the wake of the San Bernardino attacks -- "God isn't fixing this," the Daily News said -- spurred days of debates. Sunday's cover takes aim at American gunmakers, calling them "MERCHANTS OF DEATH" who "cash in on every mass shooting." Several CEOs are pictured. The tabloid has also been second to none in its criticism of Republican frontrunner Donald Trump. The paper illustrated him as a clown the day after he entered the presidential race and showed him beheading the Statue of Liberty earlier this week. The beheading cover was "a genius piece of work by our editorial cartoonist, Bill Bramhall," Rich said in an interview for CNN's "Reliable Sources." "We didn't get a lot of pushback on this one, as we have with some of our covers recently on the issue of gun violence," Rich said. The paper's crusade for tougher gun regulation dates back several years. One of the most recent covers explicitly called NRA chief Wayne LaPierre a "terrorist," comparing him to one of the San Bernardino killers. Rich argued that what he called "stonewalling" by the NRA represents "a form of terrorism because it terrorizes the safety of innocent American people." He also said the newspaper has repeatedly asked LaPierre to write an op-ed, but has not heard back. Amid all the purposefully controversial covers about gun control and GOP politics, the Daily News surprised people -- and lit up Twitter -- on December 7. The cover that day sarcastically said "everything is awesome!" It even included pictures of puppies and kittens. "We thought, Well, okay, look we've tried hitting people over the head with this, we've tried being as blunt as we can, some people just don't want to talk about it," Rich said. "So why don't we just give them what they want?" Surprising, provocative covers could boost print newsstand sales, of course. But Rich said the covers also make the Daily News more relevant on the web, well beyond the New York metro region. He said the "God isn't fixing this" and the Statue of Liberty beheading editions led to a "slight uptick" in print sales. "But it was our digital platforms that saw the biggest spikes on those covers. Millions of engagements on both"
People often ask Rich if it's fun to conceive covers that get everyone talking. "In a vacuum, yes, it is," he said. "But you have to remember that at least when it comes to the mass shootings, there are people who are losing their lives here, innocent people, and it's a tragedy. And if it weren't for that constantly happening over and over again, we wouldn't be having this conversation about our covers because we wouldn't need to be doing those covers."